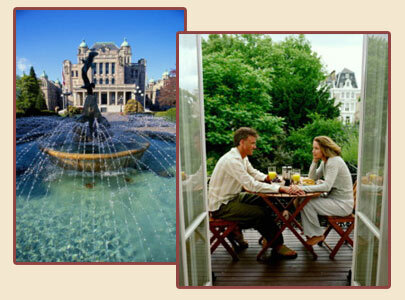 Victoria, "the city of gardens" is noted for its spectacular natural surroundings and moderate Mediterranean climate. Averaging over 2000 hours of sunshine per year and just 27 inches of rain, it is the sunniest spot in British Columbia. Along with the neighbouring communities of Saanich, Metchosin, and Sooke, this area offers visitors a wealth of experiences from the sublime to the "super-natural". Our Bed and Breakfast accommodations are located throughout Greater Victoria and offer visitors a wide range of settings, prices and facilities to meet your requirements. Our innkeepers are friendly, knowledgeable and pleased to help visitors make their visit to our area a very enjoyable one. All our B&B's are inspected and approved members of the Western Canada Bed and Breakfast Innkeepers Association and most are featured in, or endorsed by, a variety of travel guides. We have some of the best bed and breakfast establishments you will find anywhere. Please contact the individual B&B's listed, and if they cannot accommodate you, they will be pleased to refer you to other association members, who may have availability. Come and stay with us and experience great hospitality and the magic of this special place called Victoria! This site designed and maintained by BBCanada.com. BBCanada.com is not responsible for the accuracy of information supplied by subscribers. By using this web site, you agree to our terms and conditions of use.